If you’re in the market for a new car, there’s no reason to stress about your impending ordeal. While it may appear that you have a variety of choices at your disposal, your decision should actually be pretty clear as the 2019 Chevy Cruze is the perfect choice for those seeking a versatile vehicle. The nameplate delivers all of the attributes and amenities an owner could want out of their new car. While the affordability is certainly appreciated when it comes to this nameplate, drivers will be particularly enticed by all of the features engineers managed to cram in. You might also be stressing out about where you’re going to be purchasing that car. Well, there’s no need to worry. If you live in the Cincinnati, Ohio area, there isn’t a more obvious choice than McCluskey Chevrolet. The dealership doesn’t only have the best prices and an unbeatable inventory; rather, their array of services makes them your one-stop-shop when it comes to car buying. See for yourself why you should be pursuing a 2019 Chevy Cruze from McCluskey Chevy in Cincinnati, Ohio. This nameplate is one of Chevy’s most popular offerings for a reason. The 2019 Chevy Cruze includes all of the amenities and features you could possibly want from a brand-new car: incredible performance (as well as optimal fuel efficiency), a comfortable, driver-centric interior, and a long list of safety functions. You may be enticed by the glitzier, fancier offerings… but you’ll be making a huge mistake by ignoring the 2019 Chevy Cruze. See for yourself why this vehicle should be atop your list of targets. 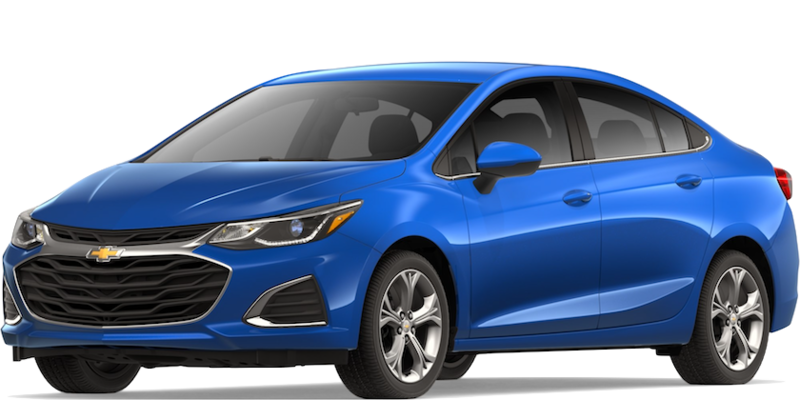 The 2019 Chevy Cruze can be equipped with two engine offerings: a gas engine and a diesel engine. Regardless of which option you end up going for, you can expect two things from your new ride: power and efficiency. The 1.4-liter EcoTec DOHC turbocharged four-cylinder engine is the standard offering, but there’s absolutely nothing “standard” about this system. Drivers can ultimately expect 153 horsepower and 177 pound-feet of torque from the engine, which is enough muscle to overcome any of your fellow drivers. Plus, thanks to inclusions like Variable Valve Timing, drivers can anticipate a 38-mile-per-gallon highway fuel efficiency, allowing them to save some extra dough when it comes to gas. The alternative 1.6-liter EcoTec DOHC turbodiesel four-cylinder engine takes the power specs to a new level, delivering 137 horsepower and 240 pound-feet of torque. Despite all of this power, the unit is also fuel efficient, delivering a 48-mile-per-gallon highway fuel economy (45 miles per gallon on the hatchback variation), leading to a highway range that’s approaching 650 miles. It doesn’t matter if you’re seeking a gas or diesel engine as you’re shopping for your new Chevy Cruze. That’s because the 2019 version of the nameplate delivers a pair of options that will satisfy any type of driver. Chevy was seemingly focused on making occupants as comfortable as possible while they’re traveling in the 2019 Cruze. Chevy’s engineers included a number of amenities that will be appreciated by both the driver and passengers, with these features influencing both comfort and convenience. All of your occupants will appreciate the standard seven-inch color touchscreen display, which will be the driver’s hub for accessing useful applications. Whether you’re seeking navigation, radio, or vehicle diagnostics, it’s only a click away. Plus, thanks to the inclusion of the Apple CarPlay and Android Auto compatibility, drivers can easily and safely take advantage of many of their phone’s functions (like playlists, phone calls, and text messages). Drivers can even opt for an available 4G LTE Wi-Fi hotspot, providing a strong wireless internet connection for all of your passengers. There’s also Bluetooth compatibility, making it more than easy to connect your preferred gadget to the car. Looking for even more advantages? Well, if customers opt for the hatchback variation of the nameplate, they’ll have a whole lot of interior space to take advantage of. Whether you’re preparing to fit your luggage for a vacation or equipment for a camping trip, you’ll have 47.2-cubic-feet of space to enjoy. In other words, you’ll never have issues fitting any of your cargo inside of the 2019 Chevy Cruze. Whether you’re relying on your 2019 Chevy Cruze as a commuter, family ride, or cross-country companion, you’ll be looking for safety functions in your new ride. Well, you’ll be more than happy with all of the safety features that engineers included in this nameplate. The majority of these functions are intended to prevent accidents from occurring altogether, whether they be high-speed (and highly-dangerous) highway collisions or standard parking lot fender benders. Either way, you can trust that your new Cruze will have your back in any dangerous driving scenario. The Low Speed Automatic Braking is an appreciated inclusion, as the technology can automatically apply the car’s brakes when a crash is imminent. The Lane Keep Assist will vicariously help to keep the nameplate on its intended path, while the accompanying Lane Departure Warning will notify the driver when they’re starting to drift. There’s even a Lane Change Alert with Side Blind Zone Alert, which will provide the driver with an extra set of eyes when they’re attempting to switch lanes. In the parking lot, drivers will surely appreciate the Rear Vision Camera, allowing them to monitor everything that’s happening behind their new car. The Rear Park Assist will help guide drivers into a tight parking spot, while the Rear Cross Traffic Alert will warn them of any crossing vehicles as they’re attempting to back out of a spot. The Cruze isn’t necessarily known for its style... meaning it’s even more impressive when you consider all of the cosmetic amenities included in the 2019 variation of the nameplate. Specifically, owners will appreciate the large grille up front, which adds an athletic persona to the ride. The long, swooping hood is aerodynamic and eye-catching, allowing you to stand out from the crowd. Perhaps most importantly (depending on what type of car buyer you are), the vehicle can be adorned in a number of different color options. Drivers can choose from a number of paint offerings, including Kinetic Blue Metallic, Red Hot, Satin Steel Metallic, Silver Ice Metallic, Summit White, Mosaic Black Metallic, Oakwood Metallic, Pepperdust Metallic, Pacific Blue Metallic, and Cajun Red Tintcoat. Drivers can also opt for specific packages, allowing drivers to truly revamp the exterior of their new ride. For instance, the RS Package includes a number of cosmetic amenities, like a rear spoiler, black moldings, and intimidating black machined wheels. In other words, if you truly want to make your Chevy Cruze your own, you’ll have the ability to make that happen. The Cruze isn’t a luxury vehicle, but you might be fooled into thinking that the nameplate is one of the more stylish rides around. If you’re seeking an affordable vehicle that’s classy and athletic, you can’t do better than the 2019 Cruze. Forget the hassles that accompany a standard car-buying experience. Instead, turn to the premier dealership in the Cincinnati, Ohio area: McCluskey Chevy. McCluskey Chevy provides everything a customer could possibly want from a car-seller, including a vast (and affordable) inventory. We have more than 1,000 (yes… that’s not a typo) new vehicles sitting on the lot. Our unmatched prices means you’ll be hard pressed to find a better deal elsewhere and the ongoing promotions can help you to save an extra chunk of cash. Once you inevitably purchase your new 2019 Chevy Cruze, it doesn’t mean your relationship with McCluskey has ended. Rather, the dealership is looking to work with our customers at every point of the buying journey. Have bad credit? McCluskey is still more-than-willing to work with you to finance your impending purchase. You don’t even need to leave the house to take advantage as you can utilize our financing tool directly on our website. Meanwhile, the service department will fix up any issues with your recent purchase, assuring you a consistent, trustworthy experience. The parts department is also in place to satisfy any of your mechanical needs. Best of all, you’ll never have to shift around your schedule in order to visit the dealership. The sales department is open seven days a week, and they’re open until 9:00 pm on Monday through Thursday. This way, you can easily visit McCluskey after work or on the weekends. The same goes for our service department, which is also open seven days a week. In fact, the service team is available until 3:00 am in the morning, helping out those who ever run into any overnight problems. Finally, McCluskey is quick and easy to find. Located right off Interstate 71 in Cincinnati, Ohio, you won’t have to waste your time driving around aimlessly trying to find us. Instead, you can expect an easy-in, easy-out experience. These are all big reasons explaining how McCluskey has established itself as one of the top dealerships in the Cincinnati, Ohio area. Check it our for yourself!